All of our image acquisition and analysis methods for multivariable, multimodal neuroimaging data have been implemented into the QUantitative Estimation of Space-Time processes in volumetric data for Neuroimaging (QUEST-NI) software application. 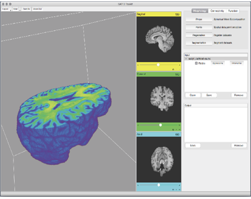 QUEST-NI provides neuroscientists with an innovative set of image analysis tools for robust segmentation, shape analysis, shape statistics, diffusion analysis, and brain atlasing. With an easy-to-use GUI and powerful, cutting-edge visualization supported by our advanced PDA methods for handling and visualizing very large data sets, providing an out-of-the-box application for both novice and expert users. It is also the go-to application for comparative morphology.